The idea of having overripe bananas at hand which I can use in different types of snacks is so appealing, that these days I reach for all the other fruits in my fruit bowl and purposely let the bananas ripen. I have used ripe bananas in everything from this fudge to banana oatmeal cookies to a few different versions of banana bread and enjoyed each one of them very much. 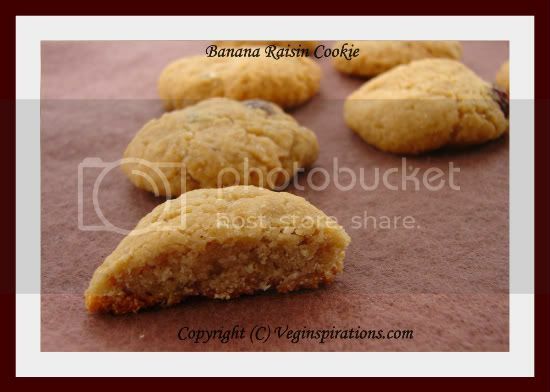 This time I decided to make Indian style cookies with bananas. In this cookie I used some semolina (suji) to give it a more nan khatai style taste and also gave this cookie a very Indian flavor by using cardamom in it. The cookies tasted very good, were a little soft and chewy and the sweetness was on the milder side which is how I like my cookies to taste. Since we liked this version so much, I made a variation of this cookie within a few days, using a combination of mung flour and chick pea flour, I will post that version tomorrow. In a smaller bowl mix the mashed banana and oil and whisk it well together. Pour the wet ingredients on the dry ingredients and mix well. Add a few tbsp of water/ milk if required to achieve cookie dough consistency. Place cookie sheet/ tray in the oven and bake for 15 to 17 minutes until it looks golden brown and lower side begins to brown. Remove and cool thoroughly on wire rack and place in an air tight container. Tastes best fresh or within a couple of days. 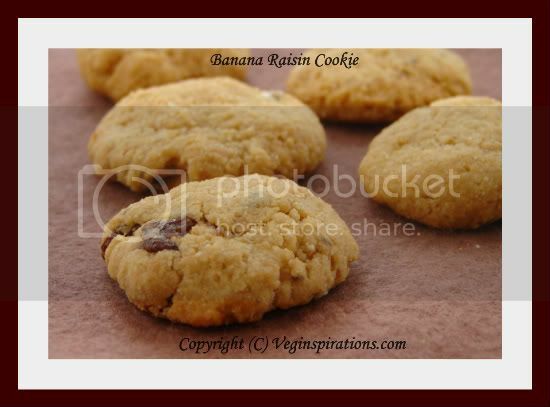 If you have a large banana, just the banana+ oil will be enough to get a cookie dough consistency. If it falls a little short, add a few tablespoons of milk to get the right consistency. Sometimes I have needed 1 to 2 Tbsp sometimes I don't need any depending on the size of my banana. Use non diary milk for a vegan version. If you like your cookies very sweet then you may want to increase the quantity of sugar to 1/2 cup instead of 1/4 cup.